Journalists threatened with redundancy at a group of weekly titles are to begin industrial action this week following a vote to strike. Members of the National Union of Journalists at Newsquest South London have notified the company they will begin a ‘work to rule’ on Thursday. The action, which means journalists will strictly adhere to company or statutory work-related rules already in place, comes after it was announced last week that NUJ members working at the affected newspapers had also voted in favour of strike action. The move comes after the union claimed that 11 editorial roles were set to be cut across the group’s 29-strong newsroom, with all bar two staff on notice of redundancy. That announcement was made after the initial ballot, which was held over inadequate staffing levels, excessive workloads, reduced quality of newspapers, the health and safety of employees and pay rates. Titles affected include the Guardian series in Croydon, Epsom, Kingston, Richmond, Sutton, Wandsworth and Wimbledon, the News Shopper series covering Bexley, Bromley, Dartford, Gravesend, and Greenwich, the Richmond & Twickenham Times and Surrey Comet. The Newsquest South London NUJ chapel has also passed a unanimous vote of no confidence in chief executive Henry Faure Walker, editorial director Toby Granville and regional managing director Tony Portelli. A chapel spokesperson said: “Senior managers have shown they have no idea what our work involves and have no interest in finding out. They’re quite happy to lose readers by compromising our ability to produce quality news. Michelle Stanistreet, NUJ general secretary, added: “The chapel’s work to rule will expose the severe levels of understaffing that already exist at Newsquest South London. Last summer, union members at the same titles held a strike which led to an agreement with Newsquest to pay trainee reporters the London Living Wage and reduce the number of job losses in a management restructure. 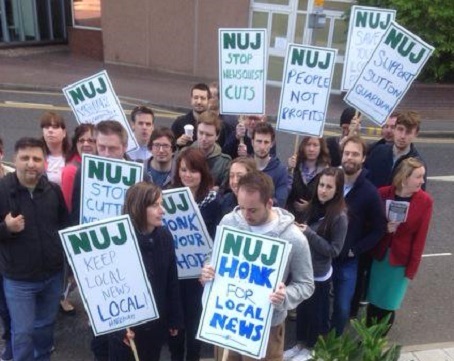 A Newsquest spokesman said: “It is disappointing that the NUJ and its members are taking this stance as we are undertaking a thorough consultation with our editorial team to ensure the best outcome for our valued staff, readers and newsbrands. Most newspapers would never be produced in their present form if staff only did their designated jobs within designated hours. These companies don’t seem to realise how reliant they are on the goodwill of their staff. Very poor management have alienated a very dedicated team. I hope they can sort it out. I quit because I got tired of working 56 hour weeks with no extra pay, no expenses, no car usage payment, no pool car.no thanks, just to get crappy paper out. That was JP, but story is same everywhere. Take the redundancy, collectively set up your own publication and you’ll see this lot off within the space of six months. I applaud, as many people do, what you are doing, but effectively you’re coming up against a savage law of diminishing returns which will only get worse as time goes by. Set up your own paper and forget the big companies. It’s the only way these days you’re going to get anything like the sort of buzz you thought you’d get from journalism. Bravo, comrades. It must have been a tough decision in these perilous times.